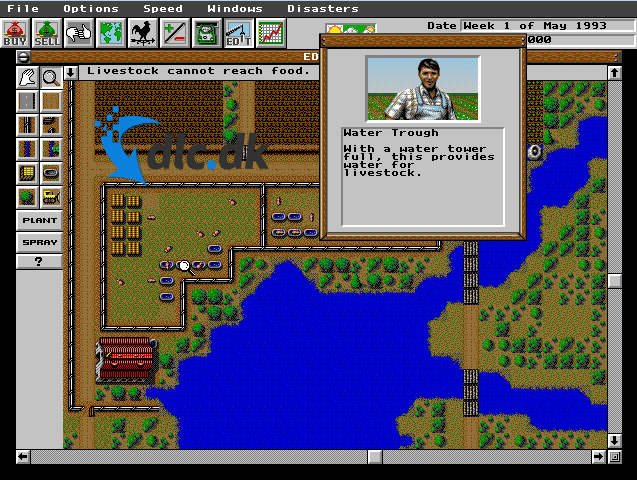 Download SimFarm here and take control of your own farm in Maxis' old, but popular farming game. Simfarm is one of the classic Maxis games where you get the opportunity to fit your own piece of land. This game must be tested and you will quickly become completely dependent on the simple yet entertaining game. Build your very own farm and see what's happening! All your actions will have an impact on the outcome in the end. SimFarm gives you the opportunity to live your dream of being a farmer. Thus you are thrown into a farm simulation. Here you will become a swimmer who, together with your family, becomes a resident of a farm where you will keep buying and selling everything for your farming and remember to care for your fields, fit your animals to get the best possible harvest and returns from your animals. You will find that as you are successful in the farm, the city becomes richer too and it will have a positive impact on you and your work. It all just gets fun and fun, the longer you get into the game. But be careful! You also have a lot to lose once you have come a long way and have been successful. Here you will not have to start over again to fight for the last. There is also a built-in weather rotating system and realistic seasons in SimFarm, which helps to make your work more difficult to achieve the perfect farmhouse. Suddenly there is a big blast of rain, even if you have just watered your crops - now you can only hope for sunshine. 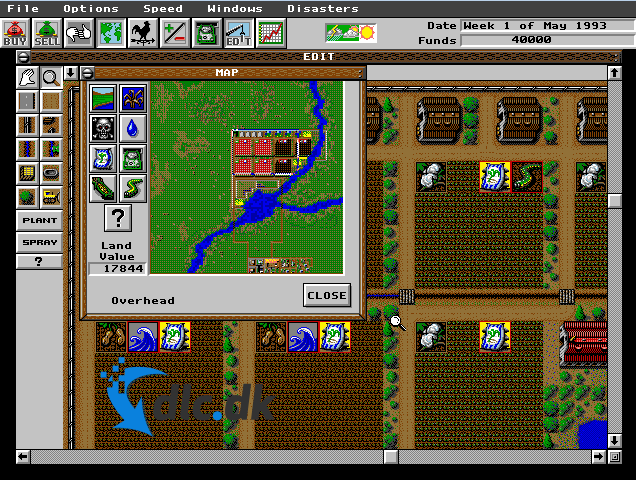 The game is, as mentioned, developed by Maxis, founded in 1987. The company is also known for their The Sims series and Spore. SimFarm was one of their previous productions, initially from 1993, but do not think it's less so for that reason. It must be played. Although it may be old, it's still incredibly fun. You may also get some feelings about The Sims, as you just have to control your own avatar, but have got some more specific tasks than the Sims you've encountered in The Sims. Maxis has had a huge success, which continues to grow. They have been particularly successful with their simulation games, which they have also done for their core task. SimFarm is certainly not a bad version of this, but it was a sign that Maxis knew what they were doing. Maxis, with his simulation game, like SimFarm, has created a whole new genre in computer games. The genre may well be called 'play god', as you just get the opportunity to create your own world and you have the power over the avatars you control. SimFarm takes you part of this new genre. Basically, SimFarm is for everyone. However, if you are one of those who likes games where there is a lot, it may not be this computer game you need to get started with. SimFarm is ultimately about strategy (and a bit of luck), and therefore it is best for users who like to take good time for consideration. You have to get a lot of things to hang out: The animals need to be taken care of, your crops must be cared for and the economy must be in plus. Therefore, do not go for action as it is your brain cells that need to be started. The goalkeeper is ultimately the player who likes to enjoy a game where there is much at stake and where you have the opportunity to build your own little story. This takes time, but it can be incredibly exciting to keep track of. If you are generally fond of game-based strategy, you can find a lot of alternative games in our category of strategy games. There are many different and you will quickly find a game that meets your wishes. If you still have not experienced Maxi's superpopular game The Sims, we have also made an adequate review of this game. You probably have heard a lot about The Sims, but it can be rewarding to hear an objective review before you get rid of it. Thus, you get an honest chance to judge if that is somethingyou before you download the game. It could also be an option to start with some more historical games, while still allowing you to manage your own avatar. An offer for this could be Build-a-lot The Elizabethan Era, where you are going to build a town for the very Queen of England. 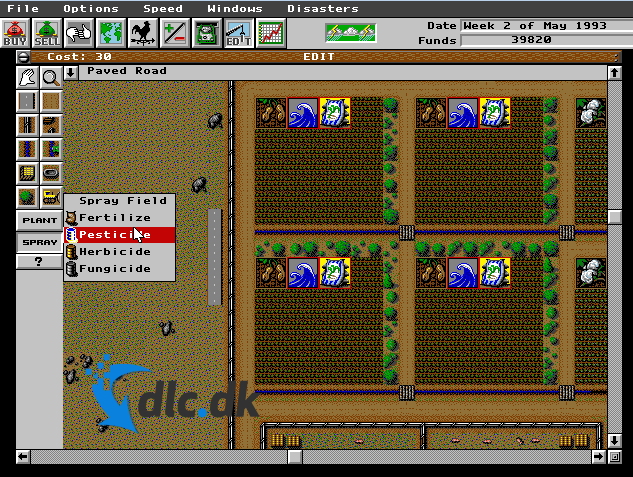 In this game you are also allowed to play farms as you also have to control the crops. SimFarm can be played on multiple systems. You can play it both with MS-DOS, Windows and Mac. Therefore, this is not to limit you as most people go under one of the three options. So if you want to play SimFarm, do not be afraid that it will not tire your computer's system - it can easily be done. SimFarm is one of the very popular abandonware games on DLC.dk, and for good reasons you may have read it in the above titles. All in all, it's a really nice game that you can quickly get bitten off, as it's just your own world and story that you build. If you need some relaxing hours, it is highly recommended that you start with SimFarm, as it is at a low pace, where you can instead afford some thorough consideration about your agriculture as you must be successful. Find Sim Farm, mark it and choose "Uninstall"
Should Sim Farm has been damaged or corrupted and thereby difficult to remove we can recommend you finding help to uninstall it here.